Virgil Everette Caldwell, age 96, of El Dorado Springs, MO, passed away Tuesday, November 9, 2010, at Community Springs Healthcare in El Dorado Springs, MO. 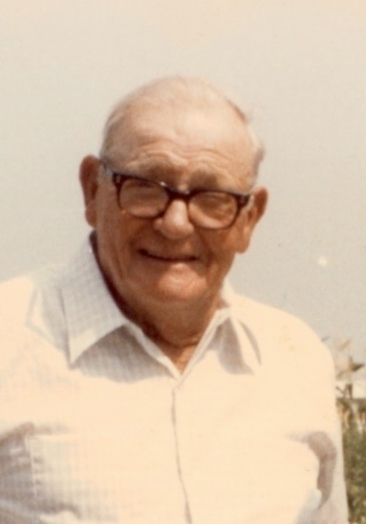 He was born June 17, 1914, in Cedar County, MO, to James Thomas Caldwell and Ella P. (Hess) Caldwell. He married Gertrude Pace on August 10, 1935, in El Dorado Springs, MO. She preceded him in death on November 19, 1992. Virgil grew up in the Red Brush area. He attended Hazel Dell Grade School and El Dorado Springs High School. Due to the death of his father Virgil had to quit school at the age of 14 and hire out as a farm hand to help support his mother and younger siblings. He worked as a farmer most of his life. Virgil loved playing baseball and was an avid St. Louis Cardinals fan. He was a member of the El Dorado Springs Methodist Church. In addition to his wife, Virgil was preceded in death by: a daughter Belva Beaty; a grandson Gregory Caldwell; one son-in-law Art Carter; three brothers, Elton, Ervin, and Wayne Caldwell; two sisters, Jewell Messick and Dixie Holcomb; one step sister Rosalie; three step brothers, Virgil, Cecil, and Carl. Survivors include four daughters: Virgie Hankins and husband Harry of Springfield, MO; Elvia Caldwell and Trudy Caldwell of El Dorado Springs, MO; and Mona Caldwell of Springfield, MO; three sons: Jim Caldwell and wife Jewell of Laramie, WY; Cecil Caldwell and wife Phyllis, and Virgil “Rocky” Caldwell and wife Jackie, all of Walker, MO; 17 grandchildren; 32 great-grandchildren; 5 great-great-grandchildren; 4 step grandchildren; 17 step great-grandchildren; 15 step great-great-grandchildren; one brother Forrest Caldwell of Muskogee, OK; two step sisters, Lorene of Osceola, MO and Katharine of Independence, MO; one sister-in-law Ellen Caldwell of Nevada, MO; and numerous nieces and nephews. The family will receive friends at Bland-Hackleman Funeral Home on Friday, November 12 from 6-7 p.m. Funeral services will be on Saturday, November 13, 2010, at 10:00 a.m. at the Bland-Hackleman Chapel with Pastor Jim Smith officiating. Interment will follow in Hazel Dell Cemetery under the direction of Bland-Hackleman Funeral Home. Pallbearers are Cecil Caldwell, Jim Caldwell, Kyle Caldwell, James Caldwell, Jr., Joe Caldwell, Klay Caldwell, Donnie Beaty, and Randy Carter.